After their failed blind date the other day, I had to keep trying to get apples and cheese together, first because I still have all these apples, and second because I’m stubborn like that. If seeing the word “cheddar” in a dessert recipe freaks you out, please have faith. 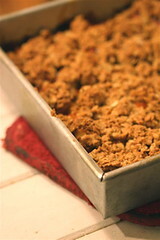 This is not cheese pie, it’s honest-to-goodness apple crisp, with a deep, earthy flavor in the crust. Just do it. If you’re back east and have access to McIntosh apples, use those. (And for God’s sake, if you didn’t realize where Apple Computer got its nickname, don’t tell anyone, especially if you’re a computer programmer by day.) I had good success with a combination of Honeycrisp, Granny Smith, and Gala apples. But damn, I miss Macs, especially the way they shine up so nicely and get all Christmassy red and green when you pick them yourself and rub them on your jeans. Sweetened with maple syrup, the crisp topping is a bit unusual: it comes together like cookie dough before baking, and gets sprinkled onto the apples over a layer of shredded cheddar cheese, of all things, in deference to the Vermont tradition of topping hot apple pie with a slice of sharp white cheddar. It forms a wonderfully crunchy, breakable crust. Underneath, the apples are tart and tender, with enough juice to make them slide over each other in your mouth. 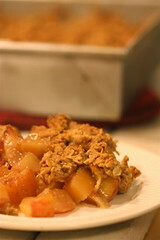 In my book, this is everything apple crisp should be. Vanilla ice cream seals the deal. Preheat the oven to 375 degrees. Spray an 8” square baking pan lightly with the vegetable oil spray, and set aside. Stir the remaining filling ingredients together in a large mixing bowl until the fruit is coated with the flour. Transfer to the baking dish and bake on the middle rack for 20 minutes. When the fruit is done, sprinkle the cheddar cheese in an even layer over the apples. Break the topping into small pieces and scatter it in an even layer over the cheese. Bake the crisp an additional 35 to 40 minutes, or until the top is nicely browned and the filling is bubbling. Serve warm.